NO – SEW Child’s Artist Smock | Who Are You Calling Crafty? I made my daughter’s artist smock two years ago for Christmas. I did not have a sewing machine that worked but I was quite handy with Liquid Stitch. I have no idea where I saw this idea originally it was two years ago (and a baby later) but I wanted to share with everyone this awesome easy Child’s Artist Smock. 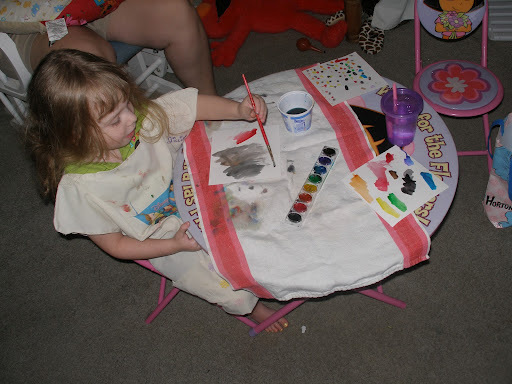 My daughter painting in her smock (2009). She now hates getting her picture taken when she is working on stuff – lol. I love this–and need to make one for my little monsters! Thanks for bringing this to the oldie’s party!